Colorful and fun these elf shoes will make a great gift for those who are young at heart. 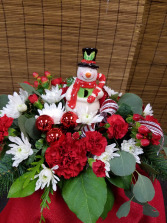 Ceramic snowman lights up this bright holiday arrangement of carnations, cushion mums and red pixies. Also comes in a Santa style. Pretty glass vase with a silver snowflake holds a nice collection of white lilies and snapdragons, green spider mums, red roses and carnations. Christmas flowers from Don's Custom Floral in Hutchinson, KS are the best way to send Christmas cheer! Flowers and poinsettia plants are a great way to spread joy throughout the season, but also make quick and easy party decor. 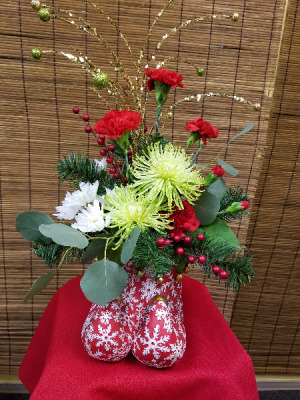 Don's Custom Floral can help you with any Christmas styles or colors with our Christmas decor accessories. Need a centerpiece or a Christmas wreath for your party? 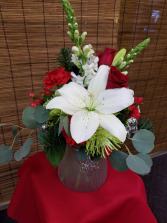 Don's Custom Floral has it, and more!